I have seasonal food habits. In winter I make pot after pot of hearty soup, I roast winter squash nearly nightly, and apple crisps rule the dessert rotation, in the spring I relish in making salads with the first fruits and greens of the season. In the summer I juice, and juice, and juice, and produce copious amounts of popsicles. But in the fall it's all about baking. Specifically pretzel baking. It seems like every fall I get this nagging little voice whispering about salty, deep golden brown crusts and soft, pillowy insides. Pretzels it whispers in my ear, soft, salty, addicting pretzels. And I cannot resist it. This weekend I fed my pretzel urges twice. 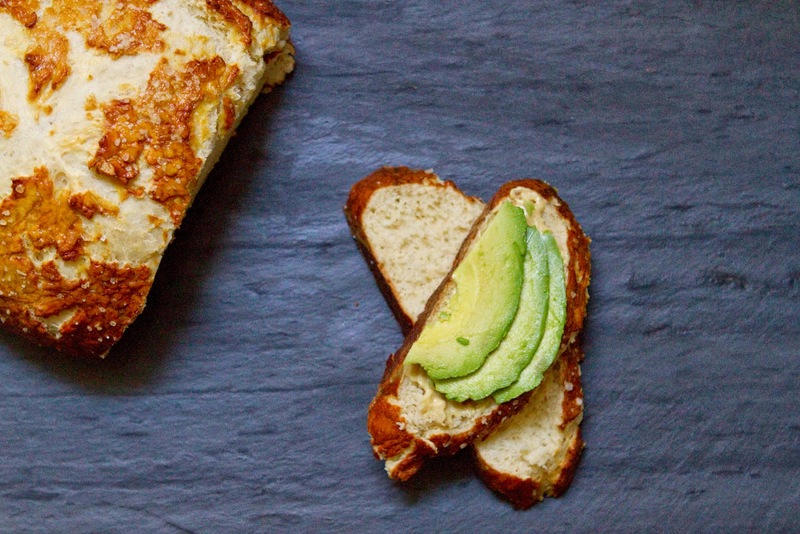 Once with this beautiful luscious bread, and once with a pretzel sweet roll that I'll share with you soon. This bread though. This bread is incredible. Quite possibly the best bread I have ever baked. I used my go-to pretzel recipe, which I have previously presented to you covered in cheese. 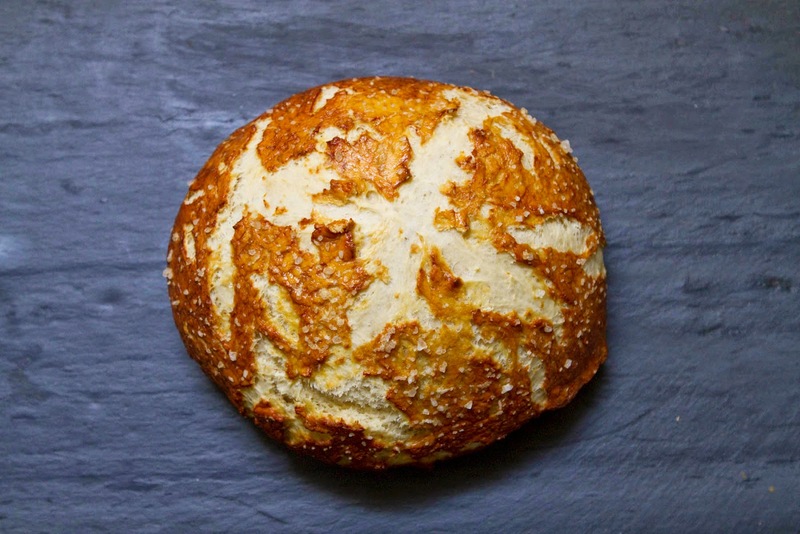 It has all the best elements of a pretzel- the salty sweetness, the unbelievably soft insides, the glossy, thin deep brown crust, but in sliceable form! Plus, it stays fresh and soft days longer than a soft pretzel. I cannot even convey to you how wonderfully soft, pillowy, and perfectly textured the inside of this bread is. It's unbelievable. The salty edges of the slice are lovely but the real treat is the middle. It manages to be substantial and hearty, yet light on the tongue. 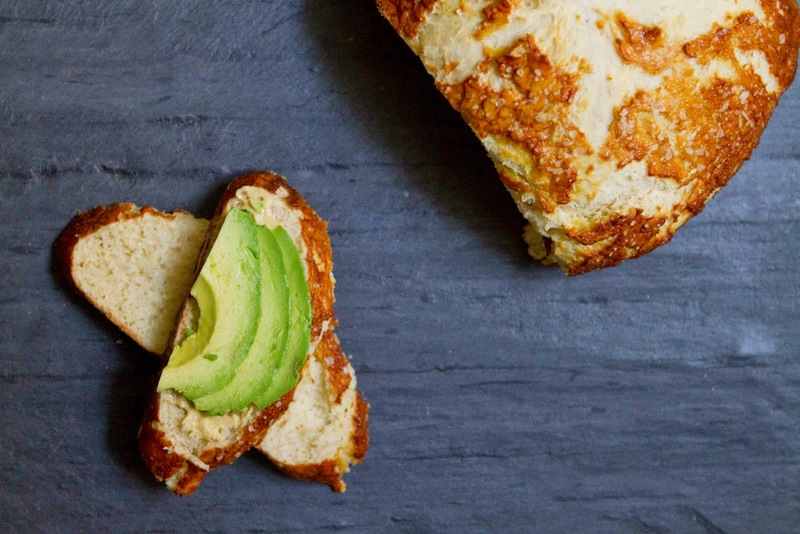 I ate the heal of the bread plain, savoring every perfect bite, and then quickly followed it up with two pieces, spread with a thin layer of dijon mustard and topped with skinny slices of avocado. This is what lunch in heaven must taste like. I followed those up with most of the rest of the loaf. 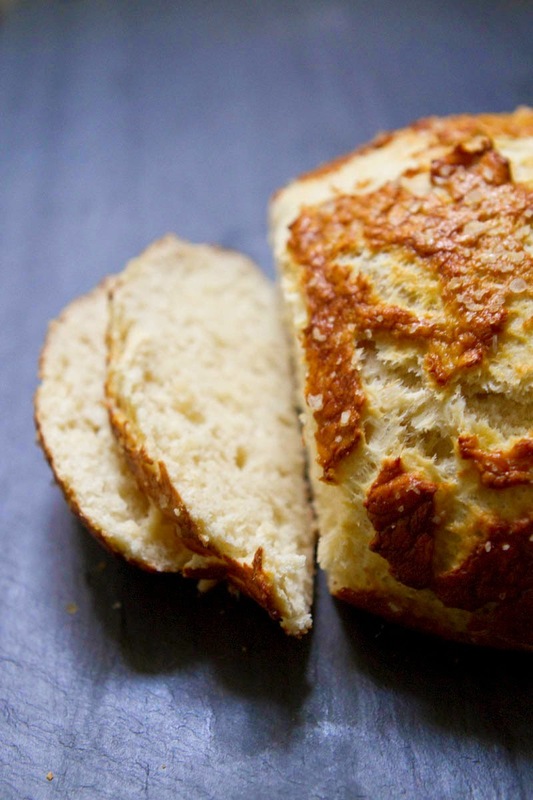 This bread is wonderful as it only has to rise once, and only for one hour, and if you end up allowing it to rise for two or three hours, it's just as good, so you can easily throw together the dough, run some errands, and then come home and boil and bake it up before dinner. I think you could even let it rise in the fridge over night, if you wanted, though this would likely lead to denser bread. 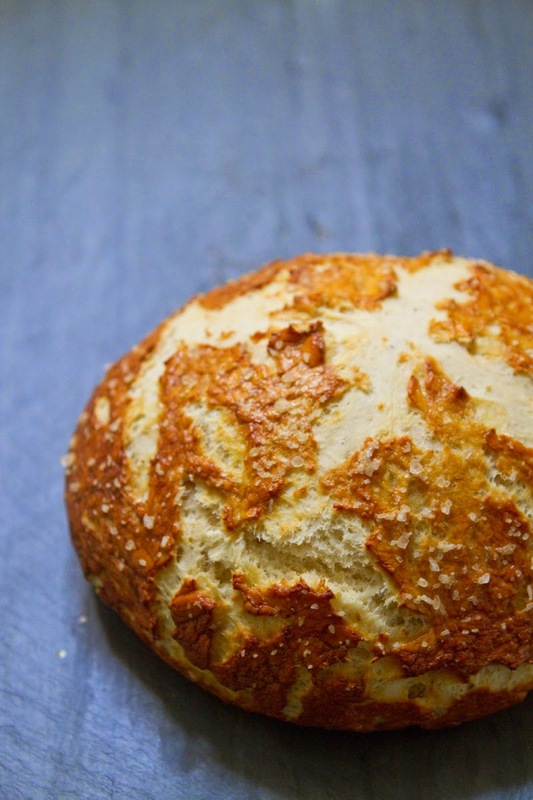 Boiling a loaf of bread before baking may seem like a strange move, but trust me on this one, it's the boiling that creates the deep brown pretzel crust and helps perfect the fluffy-yet-hearty pretzel texture inside. Once yeast has foamed up like the head of a beer add the flour to the bowl followed by the melted butter and 1 Cup beer. Using your stand mixer, or wooden spoon, mix until a dough forms, adding more flour if the dough is too wet, more water or beer if it is too dry. Once dough comes together, give it a couple of kneads then form into a ball and place in a lightly oiled bowl. Once dough has risen, combine the remaining 1/2 Cup beer, the 10 Cups water, and the baking soda and bring to a boil. Preheat oven to 425 degrees fahrenheit. Line a baking sheet with parchment paper. Divide the dough into two equal pieces and shape into loaves. Once water/baking soda combination is boiling, lower 1 loaf into the water, and boil for about 30 seconds, turning it over once or twice while boiling, then remove from the water and place on the parchment paper lined baking sheet. I used a large mesh strainer with a handle to lower my bread and fish it back out, but a large spatula would also do the trick. Repeat process with second loaf. Brush each loaf down with the egg/water mixture, sprinkle with the coarse salt and bake for about 20 minutes, or until the crust is a rich deep golden brown. Allow to cool for about five minutes before slicing. Enjoy! Thanks for such a beautiful blog. Am going to try all the spring and summer ones over the next weeks. Thanks, so glad to hear you enjoy the blog! Hope you enjoy the recipes! 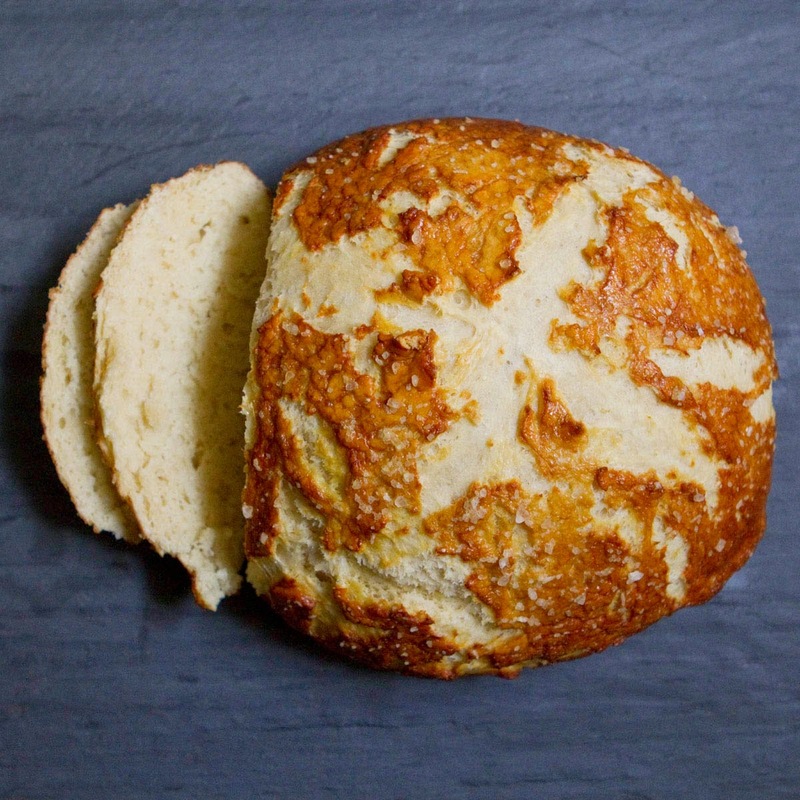 can you please share the lager black bread recipe you mention on the cheese pretzel posting? I recommend using whole wheat, or a blend of whole wheat/rye/white. It's a delicious bread! I just made this. It was outstanding and looked just like the pictures. Do you think substituting Guinness would also work. 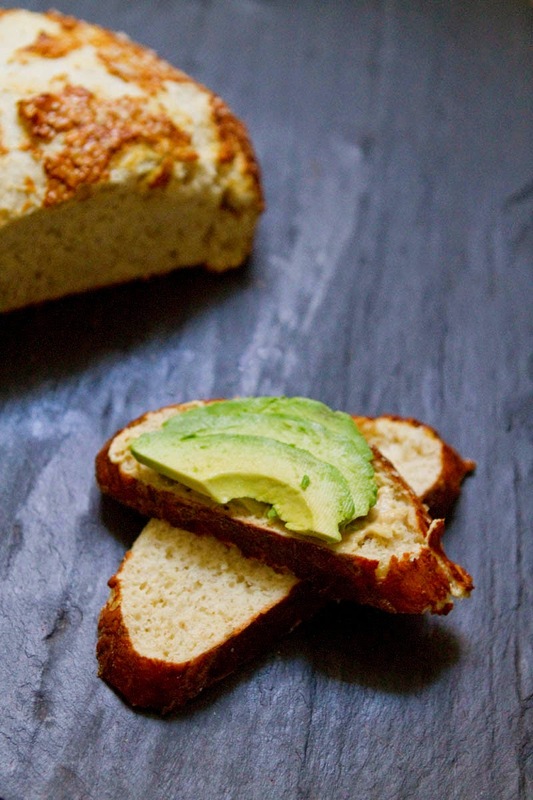 And avocado on toasted sourdough (or pretzel bread)... Outstanding!! I'm so glad you enjoyed the bread! I think Guinness would work just fine, but the beer flavor would probably be stronger than with an IPA or a lager. I've used Guinness in blackbread before and it was delightful. Let me know how it turns out if you try Guinness in the recipe!